Join us at Kingsland Wildflowers Green Roof & Community Engagement Center for a tour and talk with landscape designer, Marni Majorelle of Alive Structures and project coordinator, Niki Jackson of NYC Audubon. Kingsland Wildflowers is a Greenpoint Community Environmental Fund (GCEF) project committed to expanding natural habitat and green corridors for bird and wildlife populations. The vision, conceived through partnerships with local businesses, community voices and wildlife experts, is providing Greenpoint with living and growing infrastructure to support native New York City wildlife and educational programming focused on sustainable conservation practices and habitat protection. 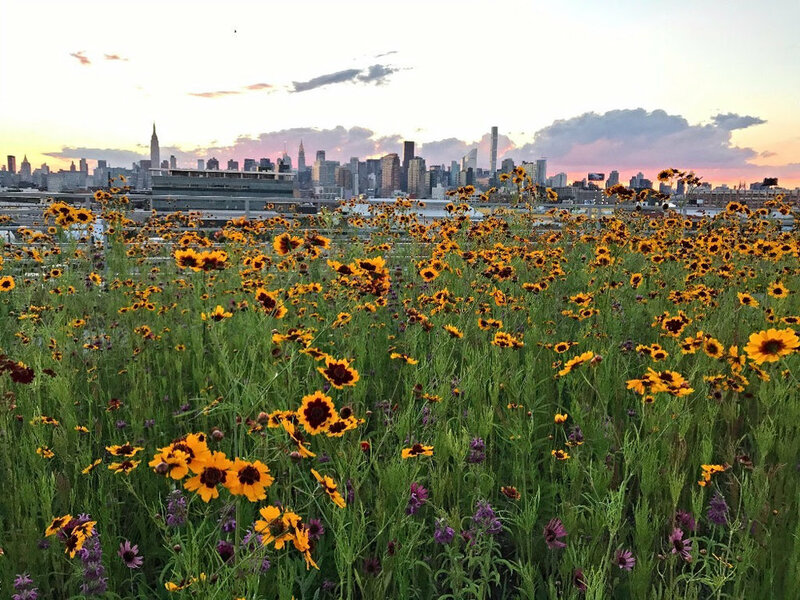 Kingsland Wildflowers is a 22,000 square foot green roof which sits atop an active movie studio owned and operated by Broadway Stages, in the most sci-fi and industrial section of North Brooklyn alongside EPA Superfund site, Newtown Creek. Our community partners include Newtown Creek Alliance and NYC Audubon. We are an educational and science-focused green roof fostering ecology, sustainability and community. Founded in 2007, Alive Structures is a certified woman-owned landscaping business based in Greenpoint, Brooklyn. The company focuses on green roofs, ecological landscapes and green walls. Marni Majorelle, the company’s founder, started her business with the intention of affecting the New York City landscape in a new and environmentally conscious way. Focused on native biodiversity, Marni has developed green roof solutions that utilize plants and grasses indigenous to New York.